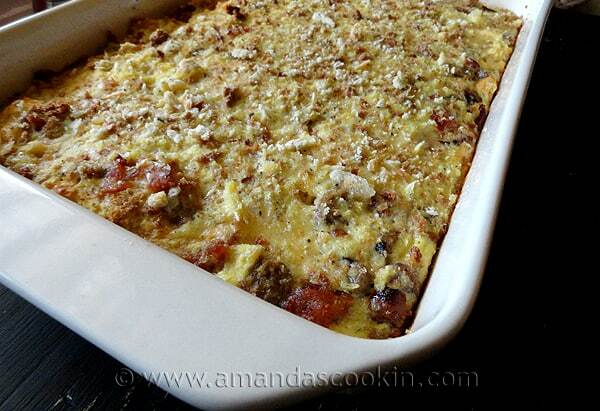 Breakfast casseroles are an excellent way to feed a crowd, which makes them ideal for the holidays. Many people have relatives visiting at this time of year, so breakfast for the masses can be quite a chore, unless of course it all goes in one pan and into the oven! 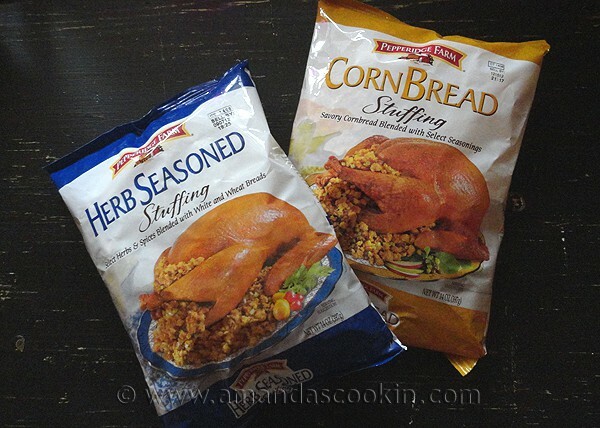 Pepperidge Farm came to me and asked if I would be willing to take on the challenge of creating a recipe using one of their delicious stuffings. I love their stuffing and usually buy the herb flavor to serve with my turkey at Thanksgiving. So of course I said yes, knowing how great it is anyway! However, this time I wanted to do something different, and to add to the challenge, they wanted a Wisconsin twist on it. Well as you know we here in Wisconsin pride ourselves on being known as “the dairy state” (even if California THINKS they are now, haha). So when I thought of cheese and milk, my mind immediately drifted toward Christmas breakfast. Frothy eggs, crisp bacon, sizzling sausage, mmmm! But anyone who has ever cooked a farmhouse style breakfast buffet for a crowd knows it’s a lot of work. Too many dishes to keep warm while cooking others. The toast always ends up soggy and cold and nothing is the same temperature. 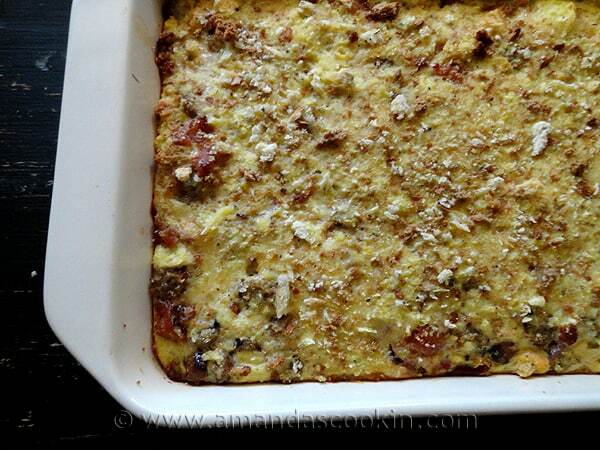 Enter the breakfast casserole. 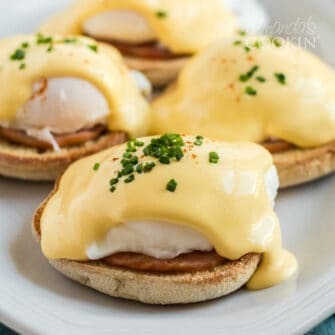 This is an excellent way to serve a piping hot breakfast that will feed the masses without all the hassles of individual platters of eggs, sides and bread. You can even make some of this ahead so there isn’t as much preparation in the morning. Some steps you can plan early are to cook and crumble the bacon, cook and slice the sausage, shred the cheese and measure out the stuffing. That will leave you with just a few steps in the morning before you pop it in the oven. Serve this delicious casserole with warm bread and butter or buttered toast. The complete directions are below. It’s pretty easy, but make things even easier on yourself by cooking, crumbled, slicing and shredding first, then make the casserole. Spread the corned beef hash in the baking pan, mix and layer ingredients per the recipe, then sprinkle with cheese. Add the whisked eggs then top with remaining stuffing. Bake, eat! 1) You can mix and match the meat in this recipe to suit your tastes. Perhaps you prefer ham, Polish sausage, or chorizo. Just measure 1 1/2 cups total for the meat. 2) Cheese – I love Gouda so that’s my choice, but really any type of cheese will work! 3) Not everyone is a fan of corned beef hash, which I line the bottom of my casserole with. A nice alternative would be frozen O’Brien Potatoes. I would measure a scant 2 cups and thaw them first, Then fry them in a skillet to warm them up before adding them to the baking pan. 4) If you prefer egg substitute, such as Egg Beaters, go for it. Since you’re scrambling the eggs anyway, egg beaters are a great alternative. 5) If you don’t have shallots, use a mild or sweet onion, such as Vidalia. You don’t need much, 2-3 tablespoons will do it. if you like, you can add in some diced bell peppers as well. Mushrooms would be delicious too! Spray a 13x9 baking pan with non stick cooking spray and preheat the oven to 350 F.
After cooking the bacon, drain the grease but don't clean the skillet. Empty the can of corned beef hash into the skillet and cook for a few minutes to warm it up and brown it lightly. Empty the warmed corn beef hash into the 13x9 pan and spread it evenly. In that same skillet, add a teaspoon of olive oil and saute the diced shallots over medium heat, just until softened and lightly browned. Whisk together the eggs and the milk and season with freshly ground pepper. Reserve 1/2 cup of the stuffing. To the remaining 1 1/2 cups, add crumbled bacon, sliced sausage links, and the shallots. Stir to combine the spread over the top of the corned beef hash in the baking pan. Sprinkle the shredded gouda cheese over the top then pour the egg mixture over everything. Use a spoon to gently press down any ingredients poking up out of the egg. Sprinkle the reserved stuffing over the top and bake for 45-50 minutes. Pepperidge Farm provided me with some tasty product samples and compensated me for the time it took to develop this recipe and purchase supplies. However, you can be confident in knowing that all opinions shared in this post are 100% honest and my own. Hi Shannen. I haven’t tried it without the hash, but I’m sure it would be fine! Amanda, Gosh, thanks so much for the mouth watering recipes. I’m for sure going to make some of them. 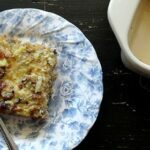 Can’t wait to try the previous stuffing casserole for Christmas morning, since stuffing is one of my sweet daughter-in-law’s favorite things. I do pray I continue to get blogs and email from you. Just even to visit, don’t you know. Thanks Pam, so glad you stopped by! anyone know if this can be made ahead and reheated? Would like to make it for a office breakfast ahead of time. That’s something I haven’t tried. You could probably make everything ahead and just not add the eggs until you are ready to put them in the oven. This looks so delicious – how do you come up with these creative ideas – and using simple, unpretentious ingredients as well! Just found your blog via pinterest and love it! Your recipes look so yummy and I can’t wait to try. 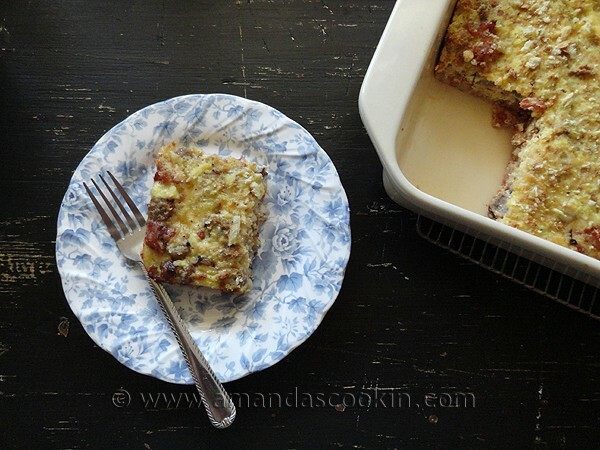 My mom always makes a breakfast casserole Christmas morning and this is a nice twist to the usual! New Follower! Looks wonderful – would have never thought of this but it’s a little like Strata! Thank you for this recipe! It looks really good, and I love all of the pictures!